"Putting the billboard levy into the arts is a big win for Toronto. Council gets to follow through on something it has promised to do and Toronto gets a more vibrant, creative city with no additional cost to the city budget or taxpayer. I invite my colleagues from across the political spectrum to follow through and deliver on our commitments to invest in arts and culture." 5. Unique tax | The billboard tax is not like other disputed taxes. It was introduced independently under Mayor Lastman in 2001 (link) specifically for arts and culture, is supported by a strong majority and was frequently cited in staff reports as popular. 6. Responsiveness | Over 60+ organizations endorse the idea from across Toronto and there are over 4700+ signatories from every Toronto ward. 7. Enhance diversity | An objective of BeautifulCity.ca and the original spirit of the the levy was to balance and expand access to creative expression in public spaces. 8. Value shared spaces | Almost all other forms of advertising subsidize significant cultural content in exchange for the public's attention (e.g. TV includes 45 minutes of educational or entertaining content in exchange for 15 minutes of advertising – newspapers provide about 50/50.) Billboards, however, effectively give only advertising to the public as people have no choice in viewing the messages. 9. 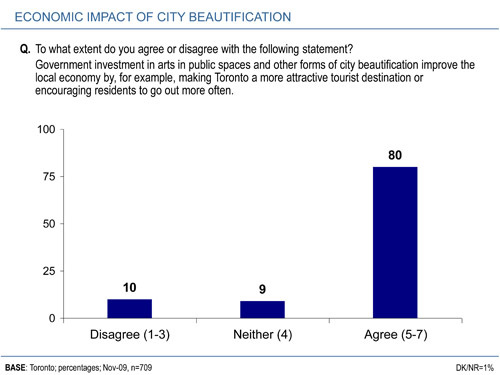 Build Toronto | According to EKOS Research, 80% of Torontonians think that government investment in arts in public spaces improves the local economy. (link) Vibrant public spaces enhance property values, improve safety, boost tourism, give something highly visible back to residents, create opportunities for small business and will help beautify and build the city. 2012 - Supreme Court of Canada upholds billboard tax. 2012 - Youth Arts Walk calls for stable investment in young people and celebrates role of arts and cultural programs in building healthy people and communities. 2012 - Ont. Court of Appeal grants City appeal, upholds tax 3-0. 2011 - City Council unanimously passes Creative Capital Gains Report. 2011 - PGM Committee unanimously approves appealing the grandfathering granted by Ontario Superior Court. 2010 - Billboard industry launches court case against City of Toronto. 2010 - City budget passed with a motion to direct "the GM of Economic Development and Culture to submit a report to Exec. within the current mandate, on possible strategies for Arts and Culture funding in future years, taking into consideration the new revenue stream created by the Billboard Tax and Council's previously adopted Culture Plan." 2009 - City Council passed the billboard bylaw and tax at 10.4 million with a 29/12 decision. A motion was also passed that directed allotment of revenue to the budgeting process. This was accompanied by explicit direction from the Budgeting Chief that in no way should this be construed as taking the revenue away from the arts – only that the regular process should be followed in disbursing the funds. 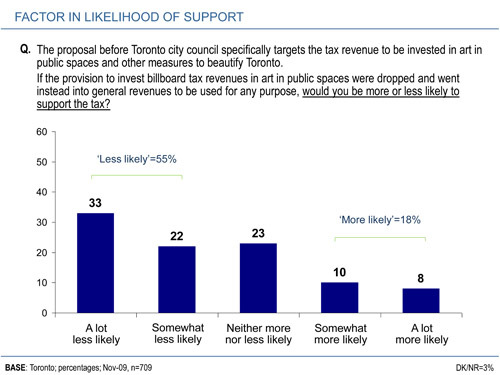 2009 - EKOS finds that 70% of Torontonians support a billboard tax to fund art. 2009 - 300+ young people assemble in Council chambers for first town hall. 2007 - In Revenue Tools Consultations, Billboard tax for art achieves a broad spectrum of public support and as the cited as most popular in staff reports. 2007 - Council directs staff to report on billboard tax for arts and culture. 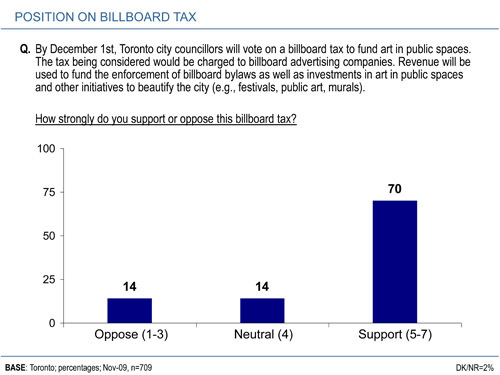 2007 - Environics finds that 7/10 Toronto voters think that the city should introduce a tax on billboards with revenue directed to public art through the TAC. 2005 - Pollara finds that majority support billboard fee to fund more public art. 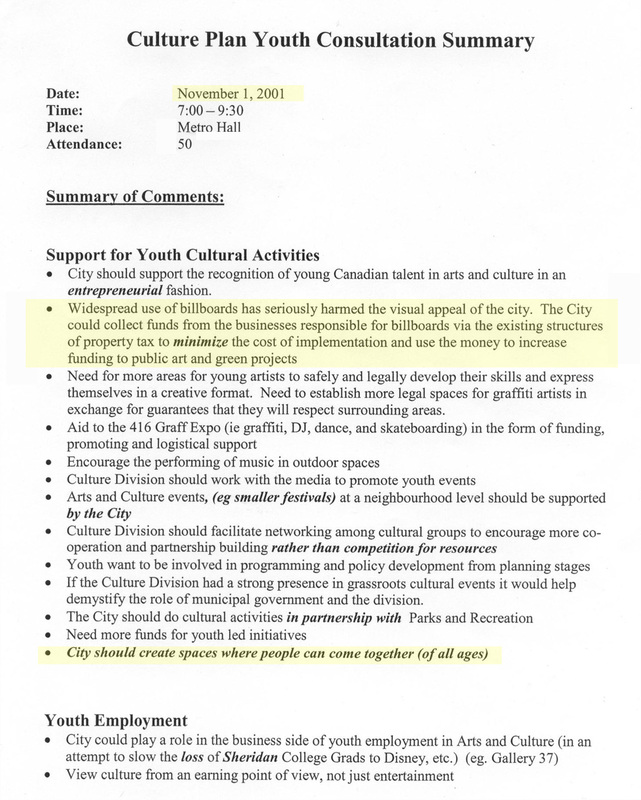 2003 - Council approves the Culture Plan inc. reaching $25 per-capita by 2008. 2001 - Idea of billboard fee to fund art in public spaces first introduced in Creative City Youth Consultations.